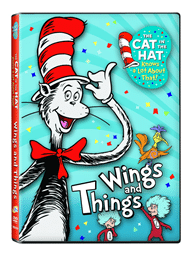 The Cat in the Hat Knows a lot about that is a brand new series and it stars Martin Short as the voice of Cat. The episodes we viewed were in the DVD Wings in Things! In it, the Cat along with a little boy and a little girl visit a bee hive, some ants and a bird house. Of course, in typical Cat in the Hat fashion, they do some quite silly things while there. The theme song is cute and catchy and you might even find yourself singing along. The girls both adored the DVD. The preschooler asks to watch it everyday after school (which we don’t oblige to). We also noticed that the series is now being shown on our local PBS channel. Win It: You can win your very own DVD copy of The Cat in the Hat Knows A lot About That! Wings in Things! I was provided a copy of The Cat in the Hat DVD to review. All opinions are my own and may differ from your experience. No other compensation was received. Who could pass up some Cat in the Hat? Hailee hasnt been introduced to Cat in the Hat yet but I think she would love it! my daughter would love that! She’s 4 and she’s really started showing an interest in trying to read on her own. Love all things Dr. Suess! Grandkids would, too! Sophie loves the Seuss books, would love to see if she likes the series! The Cat is popular around here. The school also does a big thing around here each year on Dr. Seuss Birthday. I love Seuss books. My family loves Dr Suess! This is one of my 4 year old’s newest “favorite shows” – he’s been hooked so far! I saw this on TV the other day. It looks adorable! We love Dr. Suess! Thanks for the chance! I love Dr. Seuss stories. Cat in the Hat and Green eggs and Ham, I loved as a child and now to pass that down to my daughter, is a treat! Ohhhh how fun! I love Dr. Seuss! It is such a great way to introduce children to a world of rhyming! Dr Seuss is a fav at my house! My daughter likes the new show so far. I’d love to win this. oh fun!! Lizzie loves the book, looks like a great DVD to add to the collection! My daughter LOVES the cat in the hat cartoons. Great giveaway! I love Dr. Seuss! I read the books to both my kids at hom and at school! Dr Seuss is a classic. I am so glad my daughter is able to read and enjoy Dr. Seuss books and, now, videos. This looks cute, thank you for the chance.